A player who has made some serious strides both physically and in terms of his mentality, Isaiah Austin had a strong week here in Chicago, even if it's clear that he still has a long ways to go to reach his significant potential. A legit 7-footer with a gigantic 9-3 standing reach, Austin has obviously put a great deal of work into developing his extremely lanky frame. His upper body looks noticeably stronger, and he continues to move extremely well, even if his high hips and very thin legs remain a concern. Offensively, Austin has the makings of a versatile skill-set, thanks to his excellent fundamentals. He has some basic post moves in his arsenal which are very effective if strength isn't too much of a concern, as he keeps the ball up high, has solid footwork, and shows excellent touch around the basket, releasing the ball from a vantage point that few can contest. Additionally, he has good instincts as an offensive rebounder, having the wingspan, hands and agility to go out of his area on a regular basis and secure his team extra possessions. On the perimeter, Austin has the ability to knock down shots with range out to about 18 feet, as well as solid ball-handling skills for a player his size, at times showing the ability to create his own shot and pull up off the dribble in impressive fashion. He has a good basketball IQ and appears to understand how to play within a team concept, which should make him very easy for Scott Drew to integrate into Baylor's offense next season. Defensively, Austin is an incredible presence inside the paint with his combination of length and mobility, being extremely difficult to shoot over when rotating from the weak-side when dialed in. He blocks and alters plenty of shots both on and off the ball, which will make him a commodity throughout his career at the center position. A large part of Austin's development will hinge on the continued development of his frame, particularly his lower body, which is very thin and makes it difficult for him to hold his ground effectively at times inside the paint. This is compounded by the fact that he's not the toughest or most physical big man around, while his high center of gravity makes it difficult for him to bend his knees and move his feet laterally effectively at times. Obviously still in a very early stage of development, Austin suffers from lapses in intensity on occasion and is still learning how to make his presence felt on both ends of the floor on a consistent basis. He's not always the first to offer up his body and scrap for extra possessions, particularly on the defensive glass, where he could still become more effective boxing out. A player who is likely many years away from reaching his full potential as a prospect even now, Austin is showing consistent improvement, which is all you can ask for at this stage. It's easy to see why he's so highly regarded, and considering his excellent off-court demeanor and intelligent nature, it appears likely he'll find a good amount of success in basketball eventually. A very intriguing and somewhat frustrating player to watch, there is no doubting the talent level and upside of top-rated recruit Isaiah Austin (ranked #2 by Scout, #2 Rivals, #7 ESPN). Long and lanky, standing 7-feet tall with an exceptional wingspan and a frame that has a LONG ways to go in terms of filling out, Austin has the size of a center, the skill-set of a small forward, and probably weighs less than most point guards do. Offensively, Austin likes to operate primarily facing the basket, which makes sense when considering the fact that he just doesn't have the strength to hold a spot on the block inside the paint. He likes to shoot jumpers, but sees inconsistent results doing so, and is capable of attacking the basket nicely from beyond the arc. He shows a very nice feel for the game passing the ball to teammates. He has some interesting footwork, but lacks the lower body strength to do much with it at this point, and is almost a sure bet to finish anything he catches around the basket thanks to his excellent hands, mobility and terrific standing reach. Defensively, Austin lacks much in the ways of fundamentals and is not a particularly tough guy, leaving something to be desired in terms of the intensity he brings to the floor and appearing to be very upright and at times lackadaisical on the perimeter. His motor is just OK, but his talent level is extremely high, as he not only possesses great size and length but also seems to have terrific timing hunting out blocks and steals, both in the paint and on the perimeter, which is interesting to say the least. 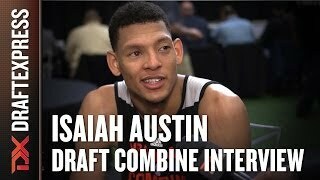 Players with Austin's combination of size, length, athleticism and perimeter skills are incredibly rare, which is why he'll always be one of the most coveted prospects in his age group and a near sure-fire pick to play in the NBA down the road. He needs to find a position and improve his frame substantially over the next few years, though, something he has plenty of time to do considering his age.